One of the most common roofing problems is roof leaks. Leaks aren't always obvious, and they can exist for quite some time before they leave a stain on your ceiling or wall and you realize there's a problem. Roof leak repair begins with roof leak detection. If the rafters and underside of your roof deck are exposed, you will have an easier time of it. That being said, it's important to note that water leaks have a way of being incredibly deceptive. 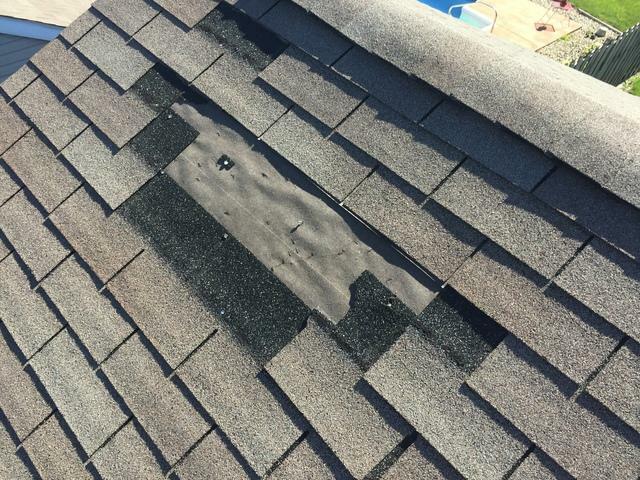 The spot where you see water and stains may be some distance from the actual roof damage. The experienced roofers at Bone Dry Roofing can inspect your roof and indentify the cause of your roof leak and provide you with a complete repair solution. We don't just treat the symptoms - we eliminate the leak at the source. If you have a roof leak in your home, call us today at 1-844-624-8253 or click below to get professional repair services. We offer free estimates in Crawfordsville, Lafayette, Frankfort and throughout the surrounding areas. Finding the origin of a leak when the underside of your roof is hidden, such as with cathedral or vaulted ceilings, is a real challenge. Water can travel several feet from where it enters before showing itself. With drywall or paneling on the ceiling, it may travel even further. A small leak may not even be noticeable except during prolonged rain fall, but that doesn't mean it's harmless. Moisture inside the roof assembly can degrade insulation and promote the growth of mold and wood-rotting fungus. Over time, even the best roofing system can develop problems. The good news is that we can replace shingles and repair a leaky roof caused by wind damage, hail damage or general wear and tear. We work with a variety of roofing materials to ensure you get the right fit for your home. Repairing a leak may be as simple as troweling roofing cement over old, cracked flashing, or as involved as replacing a large area of wind torn shingles. The roof repair experts at Bone Dry Roofing can handle any type of roof repair, including those that involve replacing fractured or rotted rafters and rotted decking. We take care to match existing shingle color and texture as closely as possible. Give us a call at 1-844-624-8253 for a free estimate for roof leak repair, roof replacement, or any other our other roofing services. We are your local roofing experts in Crawfordsville, Lafayette, Frankfort, Buck Creek, West Lafayette, Attica, Monticello, Rossville, Michigantown, Delphi and the nearby areas.